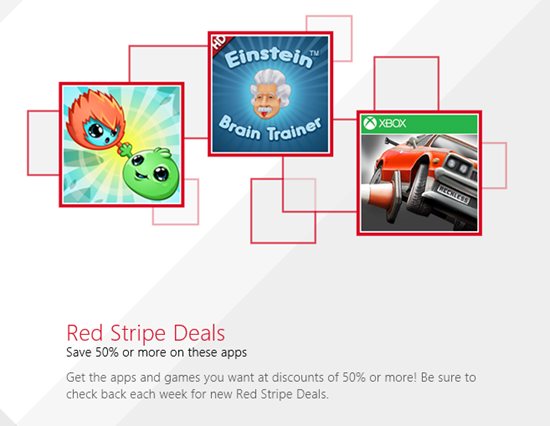 The Windows Team has taken a page from the Windows Phone Team and are offering Red Stripe Deals of their own! Reckless Racing Ultimate from Microsoft Studios. Original Price: $4.99. Sale price: $2.49. Download now! Einstein Brain Trainer from BBG Entertainment GMBH. Original price: $5.99. Sale price: $2.99. Download now! Joining Hands 2 from 0tons Ltd. Original price: $3.49. Sale price: $1.49. Download now! Written by: Hyde13 on November 22, 2013.